“Jorge”, the last Great Bustard of the province of Cadiz. 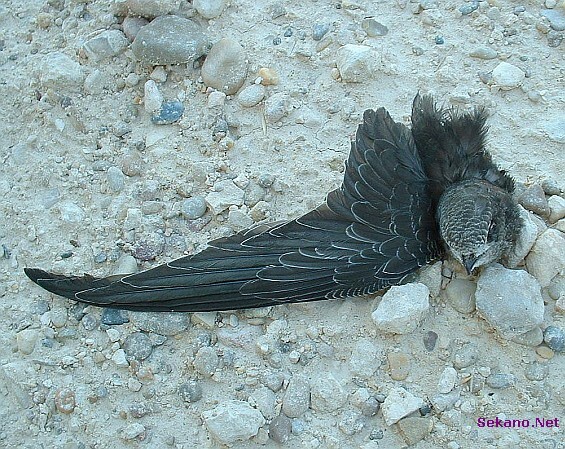 Mortally wounded by a turbine, he flew a kilometer or so, then collapsed. 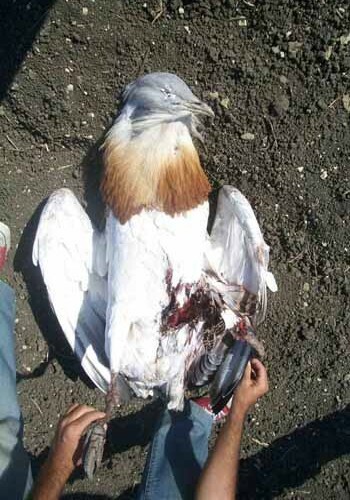 Ornithologists, who protect the wind industry at all costs in the hope to land a monitoring contract, pretended Jorge hit an overhead cable. Does this look to you like a wound from a collision with an overhead cable? Jorge was hit by a turbine blade coming from underneath. I asked for a copy of the autopsy, to no avail. The death went down in the media as caused by “a power line”. 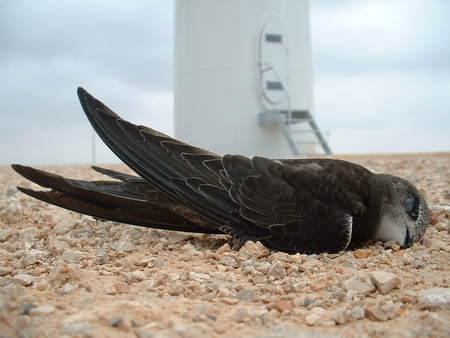 Swifts, Swallows and other Hirundines seem to be attracted to wind turbines, like bats. 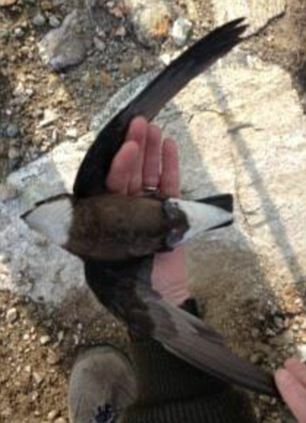 This rare white-throated needletail was killed by a small turbine in Scotland as twitchers were watching. 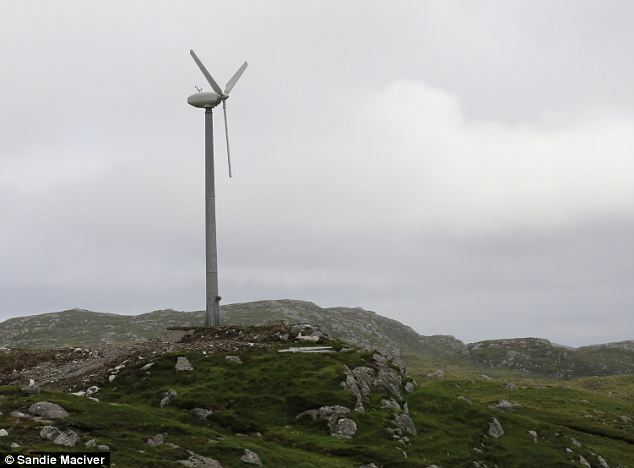 The small turbine that killed the needletail on Harris, one of the Hebrides islands off Scotland. This one was cut in half. If wind turbines attract insects, as scientists claim, then it is no surprise that they would attract insect-eating birds as they do bats. That one was just knocked dead. The strength of the blow depends on the part of the blade that hits the bird. Maximum velocity being at the tip of the blade, birds struck nearer the hub are less damaged. 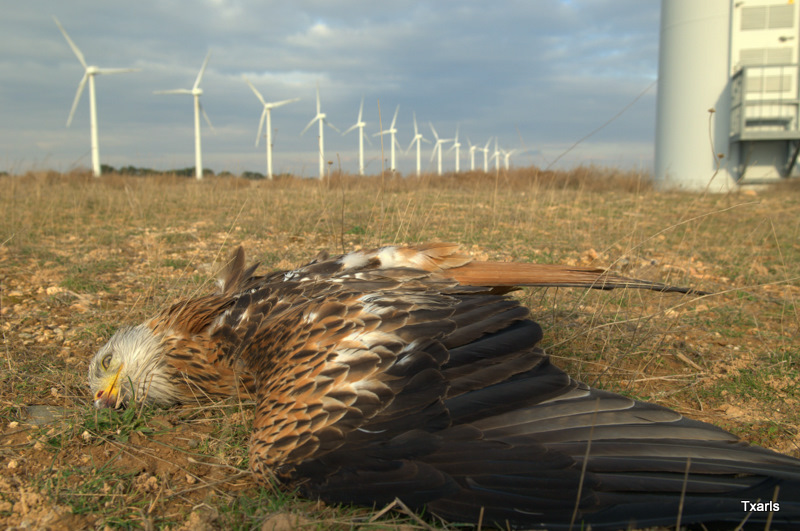 Red Kites are attracted to wind turbines, and are thus particularly vulnerable. 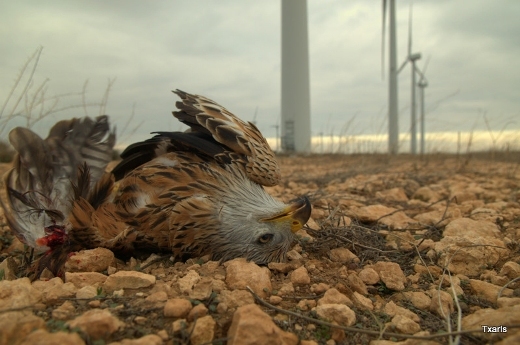 This picture is from Germany, where about 200 – 300 red kites are killed by wind turbines yearly. 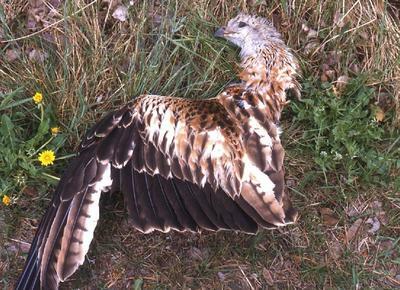 The red kite population is declining rapidly in many countries: Germany, France, Spain, Italy etc. 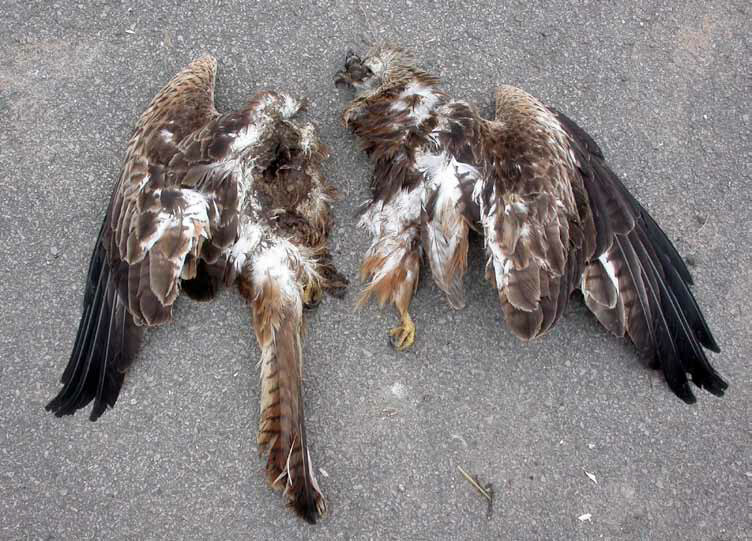 Even in the UK, where a tight cover up on bird mortality at windfarms is in place, some deaths by collision have been reported. This one, wounded in Spain, was not so lucky: its death will be slow, and unless rescued by a charitable soul, its best hope would be to be eaten quickly by a fox. Another one, left to agonise. 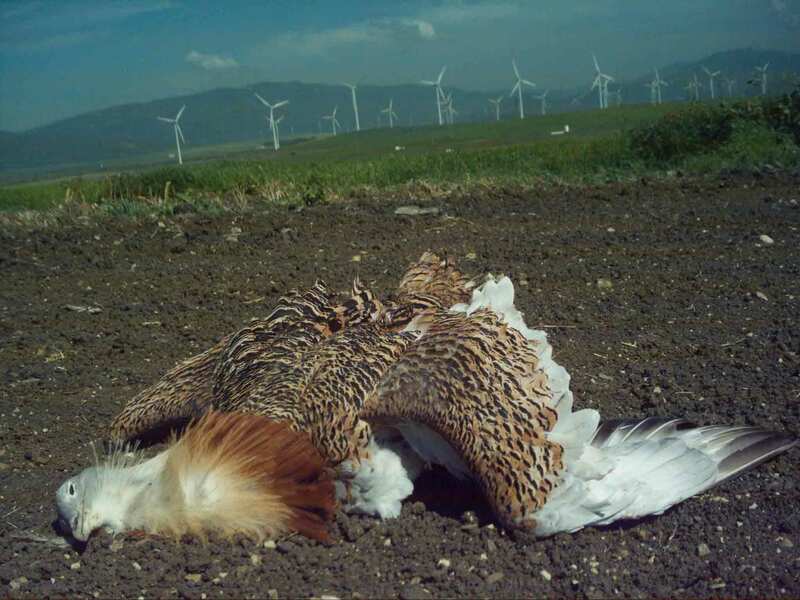 It’s a no-brainer: attracted as they are by wind turbines, open-space raptors such as eagles, ospreys, kites, falcons, harriers, buzzards, and vultures will be decimated where these machines are built. We live in California! It seams to be A Green Energy Religious Cult out here! There is Justified killing to supposedly save the planet, even when it doesn’t Work or Save anything! The media ignores the killing fields of chopped up eagles and the Obama administration just past a 30 year waver to the Killer Wind Farms! So they just don’t care. The California condor lives right in the same area, we have invested millions and millions of dollars for this endangered species, for What? I’m sure some condors are buried out of our sight! I sincerely apologize for California Wacko Birds that we elected here and at the Federal gov. level too. We need to start throwing them out of office and get some with common sense. 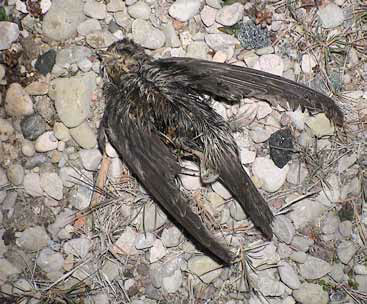 Thanks for getting light on this subject We should take these dead birds to the State Capitals and show them to the People! I have been posting articles to a site called Deviantart, regarding the disaster known as wind turbines. I found your site, this article, and if it be ok, I am using some of these images to head those articles. Deviantart is an art site but it is heavily politicized and many if not most believe wind turbines to be one of the best things happening to this world……. Not enough information goes out to the mass of people that wind turbines are not a alternative energy solution and that they kill life on earth essential birds and bats. But moreover the promise of goverbments of cheap or even free energy due wind turbines is a illusion as countries who use wind turbines sell this energy to other countries. ..While their people still pay for their energy. Solar power is one of the best solutions for the moment but people must become aware of it. Solar is horribly expensive. Even Germany can’t afford the tab: they’ve cut subsidies drastically. As far as I know, solar panels are made of contaminating materials that can’t be recycled. Thermo-solar plants fry birds and insects that cross their beams; and some waterbirds mistake solar arrays for water, and land on them, injuring themselves (generally dying afterwards from hunger or from predators). Solar panels fry if the wrong generators are being used with . .Solar farms fry, because they use also the wrong generators to produce as much power as possible in order to make as much money as possible.Solar pannels are being sponsored by governments in more and more countries….Its the generators which cost a lot of money (one efficient enough and the correct one will cost around € 25,000 in Europe)-but then they will indeed save a lot of money over the years…Plus as I have said more and more governments sponsor them.So its worth the Investment.Solar panels are being used by expeditions teams all over the world and these ‘do not’ harm any form of wildlife.The years my husband used to work in the rain forest or other places on earth before he retired ,they have always used solar pannels and never harmed wildlife as they have used the correct generators with these pannels. In fact birds nest underneath them like in Belgium and you can see the young then sitting on them later on….There is a lot of wrong information out about solar pannels and people unfortunately will also use the cheapest ways to install solar pannels which will indeed then harm wildlife as it usually the wrong generators (mainly) they safe money on or self install.The solar farms on the other hand are greedy and use the same system like people who want to safe money by installing not the correct equipment. Look at solar pannels like with everything in life – there is a lot of s*** on the market and some good decent stuff like there are cheap cowboys out there who install the equipment and decent companies. Earth is in this state due greed and unconsciousness of people and we got to sort out what’s the correct info and what not.There are recycle solar pannels.We recyclable ones ourselves like others science expedition teams. The story with the solar pannels is the same as with the wind turbines. ..Some say they harm, others claim they don’t.The only difference is that ‘all’ forms of wind turbines kill birds but not all forms of solar pannels.You just got to find the correct ones.And they must be installed by a specialist -never DID. .
Means DIY- not DID :).The panels that are recyclable and the best contain silver.All others are cheap, non recyclable and can burn…There are many good solar panel companies around but also a few gangsters…To find out if a company is decent a lot of questions should be asked.The silver panels are very expensive but again it will pay off under 3-5 years time.Its the best we have in regards to environmental friendly and animal safe. Thanks for the suggestion. We will look into that and reply here. Where is the Audubon Society on this? Have they taken full leave of their senses? According to a US Senate report just published, the Audubon Society pocketed over $450,000,000 in donations from politically-oriented organizations pushing their agendas. Please don’t fail to visit our main webpage http://savetheeaglesinternational.org and to write comments there as well. Do you have any freakin’ idea how many migrating birds are killed by high rises each and every year………You big city dwellers have no idea…..Maybe you should all destroy your big buildings to save the migrating birds. Two wrongs don’t make a right. Using the same reasoning as Pierre’s, one could argue: since so many people were killed in World War Two, who cares about a few thousand more being killed if we’d invade, say, Tunisia? or Venezuela? This is shocking , I live not far from some of these monstrosities in Ballybunion, County Kerry, Ireland thank you for highlighting the terrible decimation of these beautiful birds ,all done under the guise of “environmental protection” . You should come here to Germany! When they started with building their wind energy parks, all “nature conservationists” here in Germany were shouting against this. Today, about 10 years later, our Green Party has become much political influence and power, they rule some German countries and suddenly they support building all this. There is no more shouting against it because they become PAID for permitting it. They are the biggest liars our country has ever seen. And those wonderful birds have to pay the price for it. It hurts me so much to see those pictures! FRUSTATED! I must be dumb and I apologize if that us the case but I’d like to share this on Twitter and Facebook. Where are the icon buttons? I´ve tried to put them on just now. But they don’t show up. Perhaps it takes some time? I thought wind-energy had nothing destructive on it, until I read this. There are so called “bird scarers” https://en.wikipedia.org/wiki/Bird_scarer#Benign_acoustic_deterrence could that be a solution to this? Maybe there are even better ways as in that Wikipedia-article.